Hour and minute displays look straightforward, but they are bi-directional jumping hours with indications inversed, reflected 90° and magnified 20%. HM5 RT has a futuristic case design, but it’s from the 1970s. HM5 RT has a mechanical movement, but inspired by an era when quartz was King. The rear louvres on supercars block light, but on HM5 RT they let light in. Befitting its automotive heritage, HM5 RT has exhaust pipes, but they drain water. The gold endowing the HM5 RT case with such a rich lustrous glow was found on earth, but was actually created billions of years ago in deep space. The last couple of decades have seen an exponential growth in inventions that have revolutionised our lives. In fact, there have been so many incredible new machines that we have become blasé about innovation. Robots may not cook dinner, but they do build cars, vacuum the home and mow the lawn. Sending a man to Mars is more a question of economics than engineering. Horological Machine No.5 RT was inspired by an earlier time when we were not quite as blasé about technology as we are now: the 1970s. Imagine the excitement and dreams of the future back then. Man could fly on the road with a new genre of streamlined supercars; fly on the sea with hovercrafts; fly at supersonic speeds on Concorde; and fly to the moon in Apollo. Everything seemed possible: humanoid robots, personal jet-packs and flying cars were surely just around the corner. In the 1970s the future wasn’t tomorrow, it was today! While we might still be waiting for flying cars, with HM5 RT you can put a high-tech golden supercar on your wrist! A deep-brush case finish brings out the lush richness of the 5N red gold and the warmth of the precious metal creates a perfect juxtaposition with the cool electric-blue trim around the time display. Grade 5 titanium flanking the lower sides and base of the case both highlights and softens the formal nobility of the red gold. While HM5 RT has a generously sized 51.5mm x 49mm case and gold is known for its weight as much as its beauty, thanks to the discrete use of ultra-light titanium, HM5 RT is a very comfortable machine to wear. HM5 RT is a luxurious limited edition of 66 pieces in 5N red gold and titanium. Inspiration and realisation: For MB&F founder Maximilian Büsser, growing up as a child in the 1970s meant living in a constant state of awe and wonder. Supersonic jets flew through the air and through space; American muscle cars dominated the silver screen in road movies and fuelled the imagination. The Lamborghini Miura launched a new genre of supercars that looked as though they could break the sound barrier while standing still (creations that led the young Max to dream of being a car designer). Lasers, transistors, microwaves, hovercrafts and jet-packs gave the impression that the difference between science fiction and science fact was just a matter of when, not if. And with the arrival of quartz wristwatches, watch designs were transformed from looking like something your grandfather wore, to something Captain Kirk might wear on the Starship Enterprise. HM5 RT takes these childhood dreams and gives them a new lease of life by putting them On the Road Again. Case: The unmistakable wedge-shaped case of On the Road Again is direct homage to the plucky Amida Digitrend. However, it also has unmistakable references to the low-slung supercars of the epoch. The purpose of the louvres on these awe-inspiring cars was to restrict sunlight (and heat) from entering the near horizontal rear window. 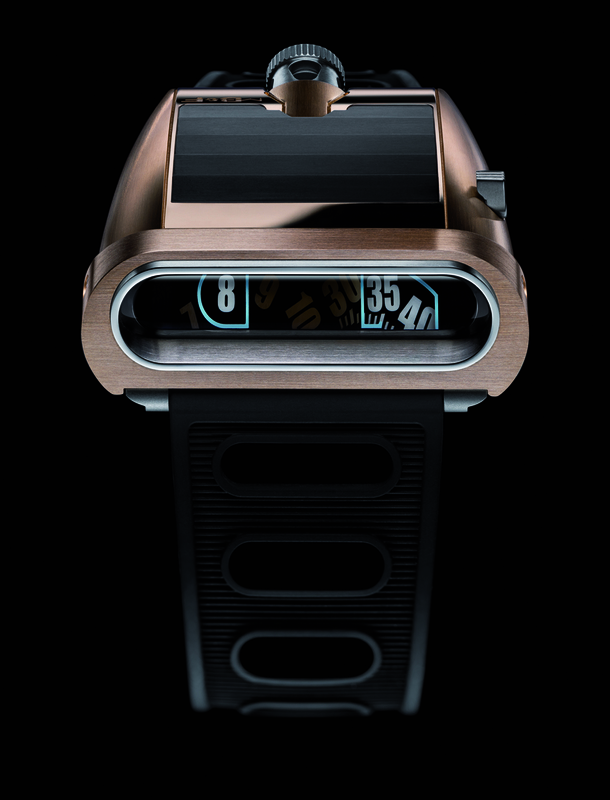 The functional louvres on HM5 do the opposite in that they open to allow light down onto the Super-LumiNova numbers on the hours and minutes indication disks to charge them. The disks are actually flat on top of the movement (under the louvres), not vertically at the front of the case where they appear to be thanks to some optical magic. Opening and closing the louvres also changes the dial’s light intensity. The louvres are opened and closed by a slide set into the side of the case. Another distinguishing feature of supercars are large dual exhaust pipes that are usually seen accompanied by a roar of engine noise and smoking rubber. But HM5’s exhausts are not there to expel combustion gases in a throaty roar, but to drain water in case – like James Bond’s Lotus in ‘The Spy Who Loved Me’ – HM5 RT gets wet. And no futurist icon of the 1970s is complete without a jet. 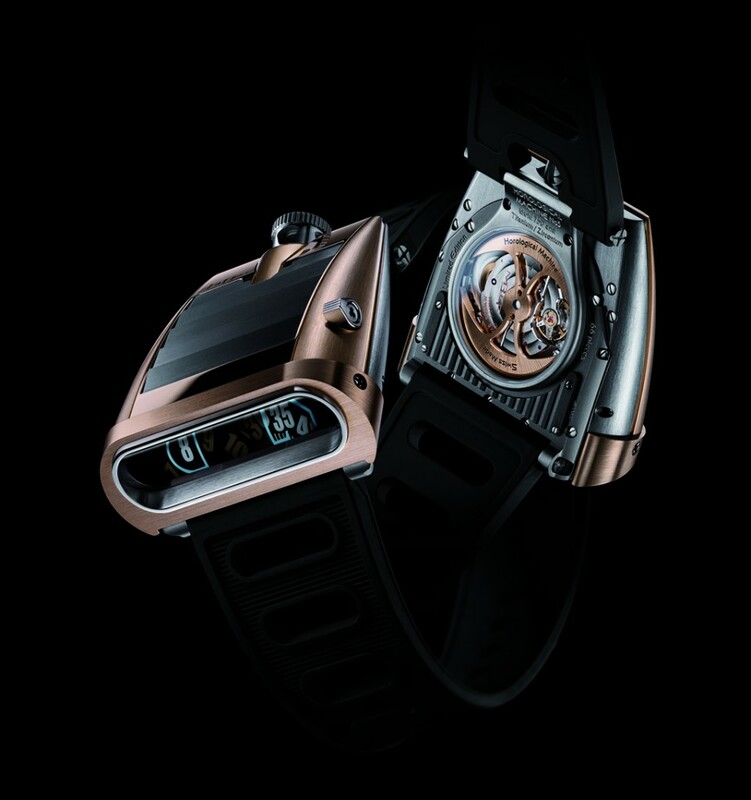 HM5 RT’s ergonomically sculptured crown – inset with the MB&F battle-axe motif – looks as though it could just as easily power a rocket to the Alpha Centauri, or the Batmobile, as it powers On the Road Again into the future. To minimise potential damage, the crown winding stem is guided by three radial bearings. It can only be pulled/pushed when perpendicular to the movement. Indications and reflective prism: The actual hour and minute time displays on HM5 RT, i.e. the numbered rotating disks, are relatively simple: overlapping disks (one for hours, one for minutes) are completely covered in Super-LumiNova, which then has large 8mm numerals created by masking all of the lume except for the numbers. The disks rotate flat on top of the movement and yet we see the time indications vertically in a ‘dashboard’ at the front of the case. To achieve this, MB&F worked with a high-precision optical glass supplier to develop a sapphire crystal reflective prism that bent light from the disks 90° as well as magnify it by 20% to maximise legibility. Because the time is reflected, the numbers are printed on the disks as mirror images so that they display correctly on the ‘dial’. The glass on the front is not black but dark-tinted so that it is possible to see time arriving and departing and the numbers have an iridescent outline, reminiscent of the original Digitrend (which tried to look as through it had a quartz-like LED display) and the glowing instruments of a supercar on a high-speed road trip at night. The vertical forward-facing display makes HM5 RT an excellent driver’s watch as there is no need to lift your wrist from the steering wheel to read the display. Engine and internal housing: As with any supercar, the best often lies under the hood and ‘lifting the hood’ of the HM5 RT case reveals a surprise: an inner case! Like a Russian Matryoshka doll, peeling away one layer reveals a second case in titanium. The reason for housing the Engine in an inner container is for water resistance. Those supercar louvres let in water as well as light − the reason for those dual exhaust ports ­– so to protect the high-performance Engine from moisture as well as shocks, it is housed in its own titanium shell. This inner case is similar to the rigid chassis of a car on which the external coachwork/body is attached. Jean-François Mojon, Vincent Boucard and the team at Chronode developed the HM5 Engine. It may appear simple, but it’s complicated! Jumping hours are bi-directional, enabling the time to be easily set both forwards and backwards. The two mineral glass disks of the hours and minutes are supported by a flat wide bridge. The disks overlap to maximise their diameter and space for large legible numerals. 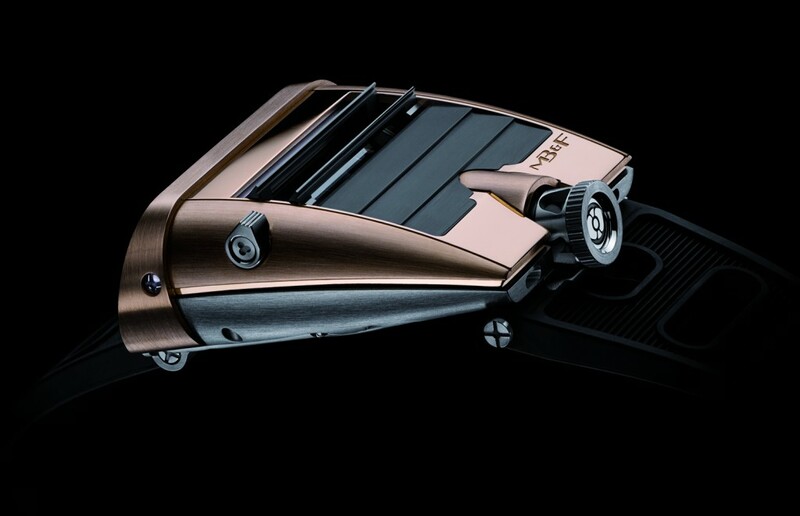 Turning HM5 RT over reveals the Engine, with its 22k gold battle-axe shaped ‘mystery’ winding rotor, fast oscillating balance and stunning hand-finished bridges, through a sapphire crystal display back that is set into the water resistant container. The projects that gave Maximilian Büsser the most pleasure during his 15 years managing prestigious watch brands were those working with talented independent watchmakers. An idea for his own personal utopia emerged: that of creating a company dedicated to designing and crafting small series of radical concept watches in collaboration with talented professionals he respected and enjoyed working with. The entrepreneur in Büsser brought the idea to reality. MB&F is an artistic and micro-engineering concept laboratory in which collectives of independent horological professionals are assembled each year to design and craft radical Horological Machines. Respecting tradition without being shackled by it enables MB&F to act as a catalyst in fusing traditional, high-quality watchmaking with cutting-edge technology to create avant-garde three-dimensional sculpture. MB&F’s first timepiece, Horological Machine No1 (HM1) was delivered from 2007 and introduced the concept of three-dimensional architectural horology. This was followed by HM2 in 2008 and HM3 in 2009, both a celebration of science fiction. 2010 saw the launch of HM4 Thunderbolt, regarded by many as MB&F’s most audacious machine. In 2011, Legacy Machine No1 heralded the introduction of a new, traditionally-inspired line. HM5, presented in 2012, took its cues from futuristic-looking icons of the 1970s. 2013 saw the launch of Legacy Machine N°2 featuring dual floating balance wheels. Maximilian Büsser was born in Milan, Italy, before moving at an early age to Lausanne, Switzerland. Growing up in a multi-cultural environment and family – his father was a Swiss diplomat who met his mother, an Indian national, in Bombay – led Büsser to develop a cross-cultural, broad-based approach to life and to business. In July 2005, at the age of 38, Büsser created the world’s first horological concept laboratory: MB&F (Maximilian Büsser & Friends), in which he is now partnered with Serge Kriknoff. Büsser’s dream with MB&F is to develop radical horological concepts, with hyper-creative groups of people he enjoys working with. Entrepreneurship is Maximilian Büsser’s forte. 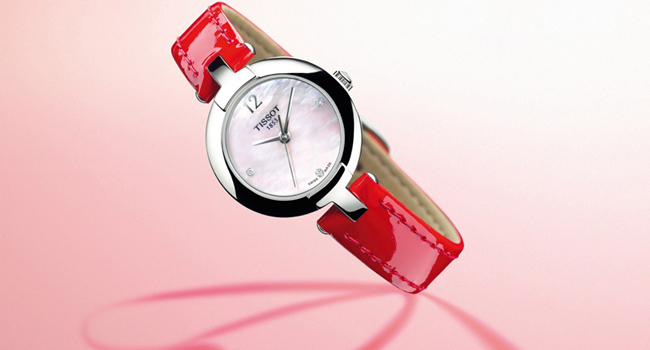 In 1998, when only 31, he was appointed managing director of Harry Winston Rare Timepieces. Over seven years, Büsser turned the company into a respected haute horlogerie brand by developing strategy, products, marketing and worldwide distribution, while integrating design, R&D and manufacturing in-house. This led to a 900 per cent increase in turnover and the positioning of Harry Winston as one of the leaders in this very competitive sector.